Posted on May 4, 2016 at 11:27 am. 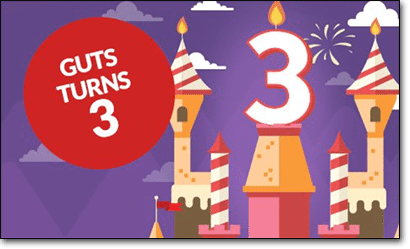 Guts Casino is about to turn three years old and to celebrate this milestone birthday, Guts is about to launch three weeks of prizes, including free spins, cash credits and for one lucky player, the chance to win a trip to a deserted tropical island. That’s about all the information we have for now, with Guts.com only just releasing a cryptic teaser trailer for the upcoming promotion, which you can view by heading to the ‘Guts Turns Three’ promotional page at Guts Casino. We’ll have more information with details on how to win and exactly what prizes are up for grabs as soon as the casino unveils more details. As one of our favourite top rated online casinos, it’s hard to believe that Guts has only been around for three years. It’s been a pleasure to watch this young casino become an industry leader, growing from strength to strength within such a short amount of time. Given the amount that Guts has achieved over three short years, it’s exciting to see where the venue is headed for the future and it will no doubt remain on our top-rated list for many years to come. Guts has recently added a bunch of new pokies to its collection, including Jimi Hendrix, King Kong, The Wild Chase, Frankenslots Monster, Bar Bar Black Sheep, Jewel Blast, Crystal Queen and Cloud Quest, so if it’s been awhile since you stopped by this venue, there’s tonnes of new content waiting for you to try. We expect the full details of the Guts Turns Three promo to drop any moment now, so stay tuned to see how you can claim your piece of the Guts birthday cake. Register for an account with Guts Casino today to claim up to $400 in welcome bonuses and 100 free spins to use on NetEnt’s Starburst.